Trail riding continues to grow in popularity and continues to evolve every year with new technology that makes riding easier and much more fun. The Ibis Mojo 3 GX Eagle Bike is a perfect trail bike that performs excellently while climbing and descending. It has a lightweight and highly durable carbon fiber frame that uses DW-Link suspension and has 140mm of travel on the front and 130mm of travel on the rear. The frame has Boost hub spacing on the rear for better handling and the frame also uses a threaded bottom bracket, because no one really likes press-fit bottom brackets. The geometry has 425mm chainstays while also accommodating 2.8" plus-sized tires. The GX Eagle version of the Mojo 3 has a SRAM GX Eagle 12-Speed drivetrain which includes the shifters, rear derailleur, and chain. SRAM's Eagle drivetrains provide a simple and reliable setup that has an excellent 10-50-tooth gear range so you can easily ride in all terrains. The Shimano Deore 2-Piston hydraulic disc brakes offer confidence-inspiring stopping power that many riders love when riding aggressive trails. The KS LEV-Si Dropper Post makes it easy to transition from climbing to descending with just the press of a lever. You can lift and lower your saddle without dismounting your bike. The Ibis 738 wheels are expertly paired with a front Schwalbe Hans Dampf and rear Nobby Nic tires that are both tubeless ready so you can ride with lower tire pressures for a smoother ride and better traction. Lastly, Fox provides the front and rear suspension for a supple feel while also performing well over the smaller bumps as well. 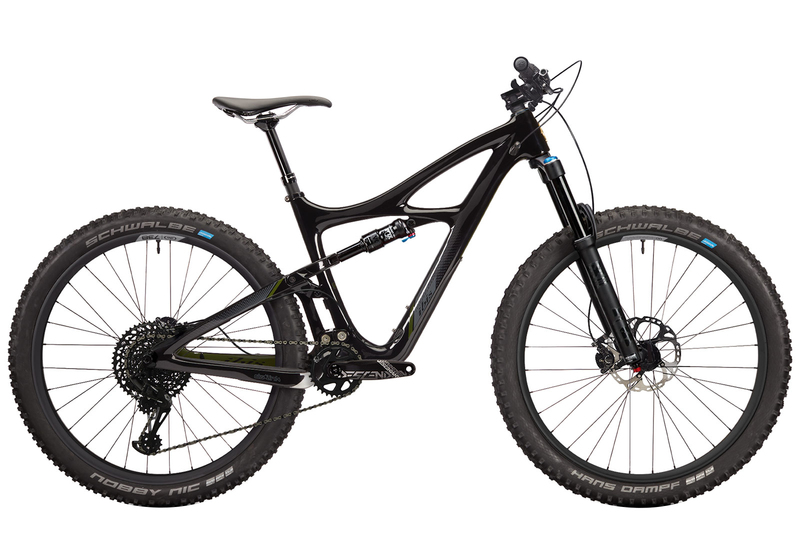 If you're looking for a trail bike with tons of versatility, then you'll want to pick up an Ibis Mojo 3 GX Eagle Bike. Front: Schwalbe Hans Dampf 27.5x2.6"
Rear: Schwalbe Nobby Nic 27.5x2.6"
Are the Devore levers the M6000 series? Compatible with I-spec II?